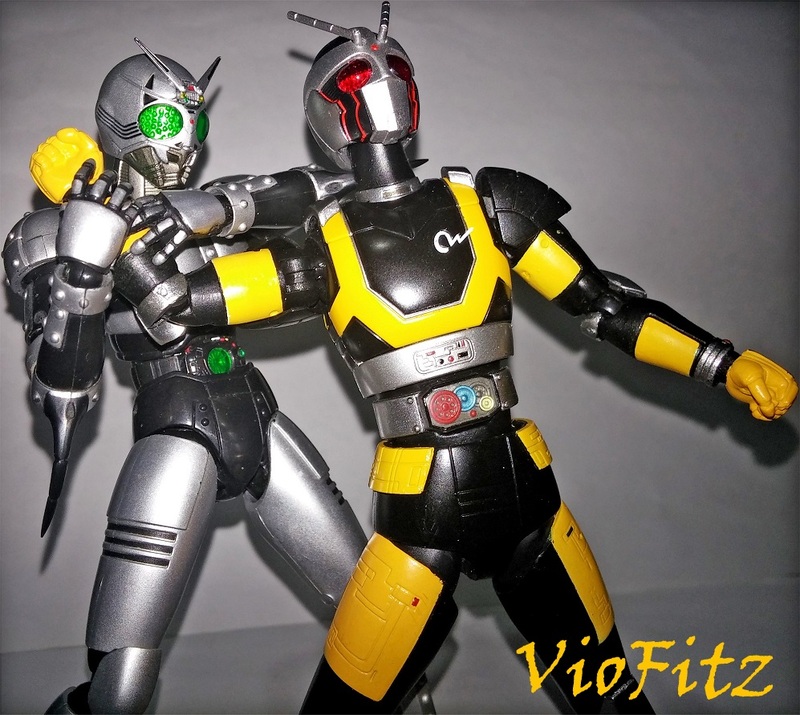 A late review of another S.H.Figuarts figure, & another of my proudful childhood memories, Here comes S.H.Figuarts Robo Rider & Roboizer review! 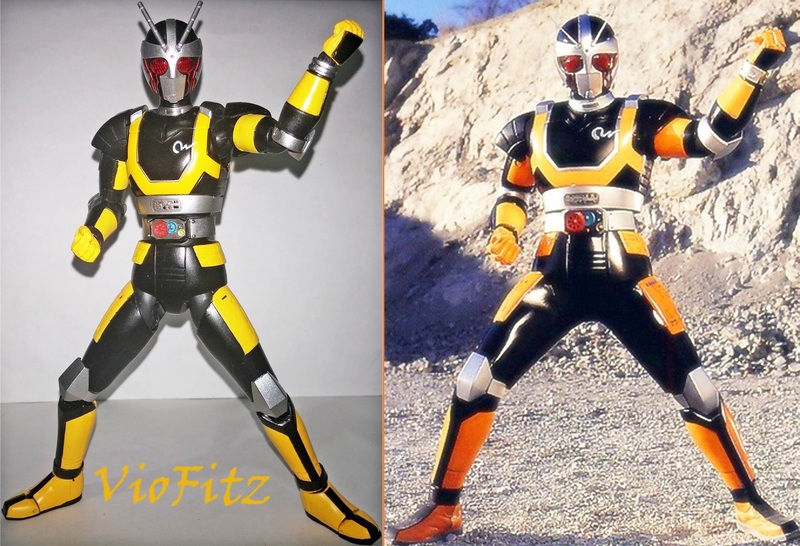 Robo Rider, known as the Prince of Sadness and Prince of Flames, is Black RX’s armored form manifested through sorrow for the love of humanity. 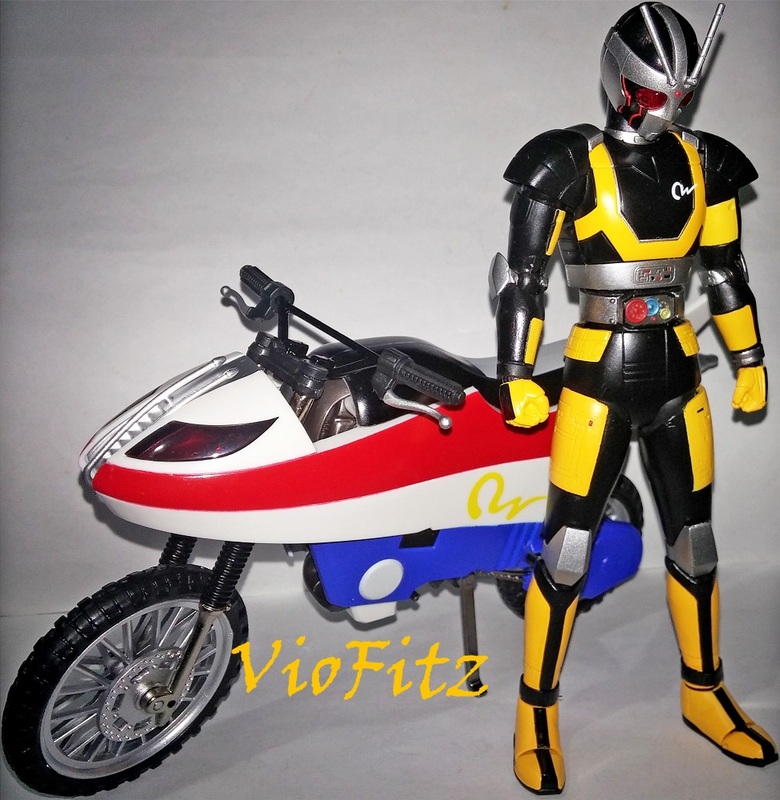 Roboizer is a living motorcycle & is the 2nd form of Acrobatter, it transformed into Roboizer when BLACK RX becomes Robo Rider. 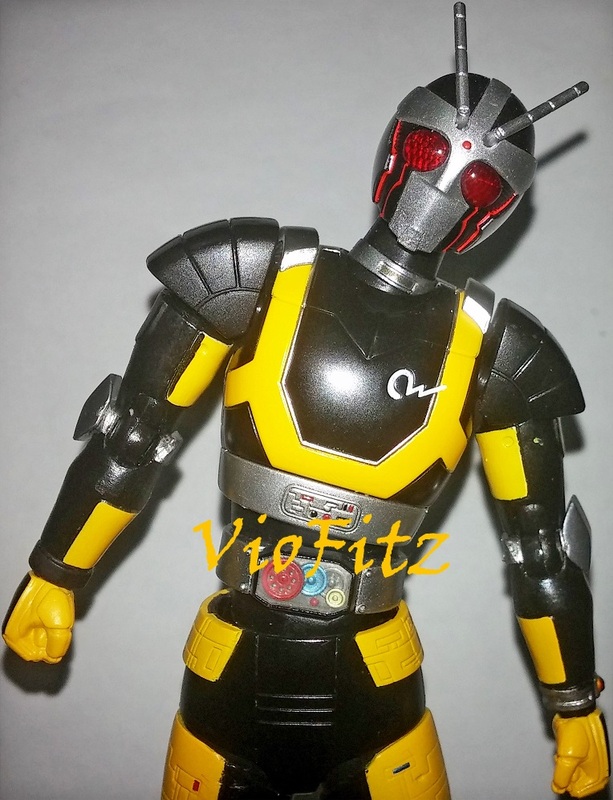 Okay, to review Robo Rider is a standard release, simillar to BLACK Renewal Series, the box was designed exactly like his predecessors release but, colored dark orange to black-ish & there’s an FX motives on it. Roboizer’s box is exactly simillar to Road Sector, it has a blind box & the boxart design shown much like Road Sector. It’s unfortunate that Roboizer is an exclusive release so, he gets a brown case as well… Well, unlike the predecessor release of BLACK series, both of them are completely a let down. Both Robo & Roboizer comes up with a very limited accessories. 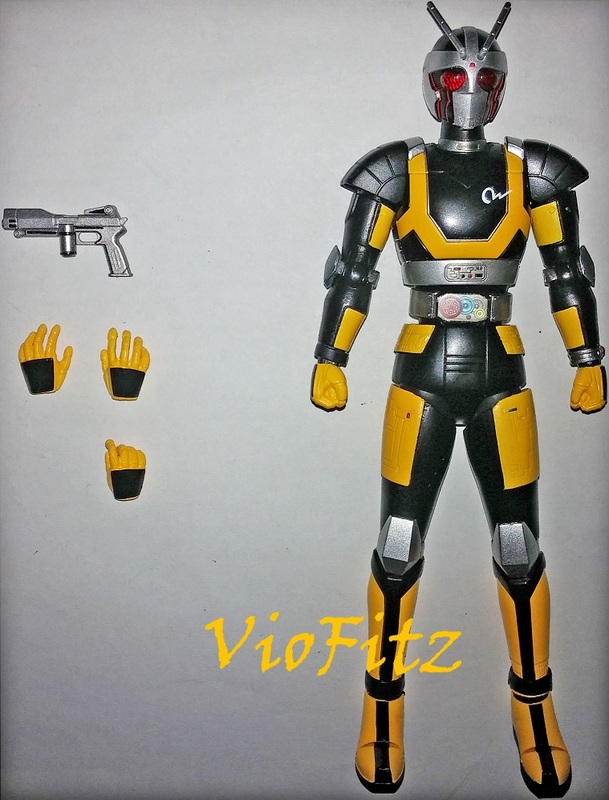 Robo comes with 3 hands & Vortech Shooter hand gun, while Roboizer comes with 1 Display Stand & a pair of grasping hand for Robo Rider. 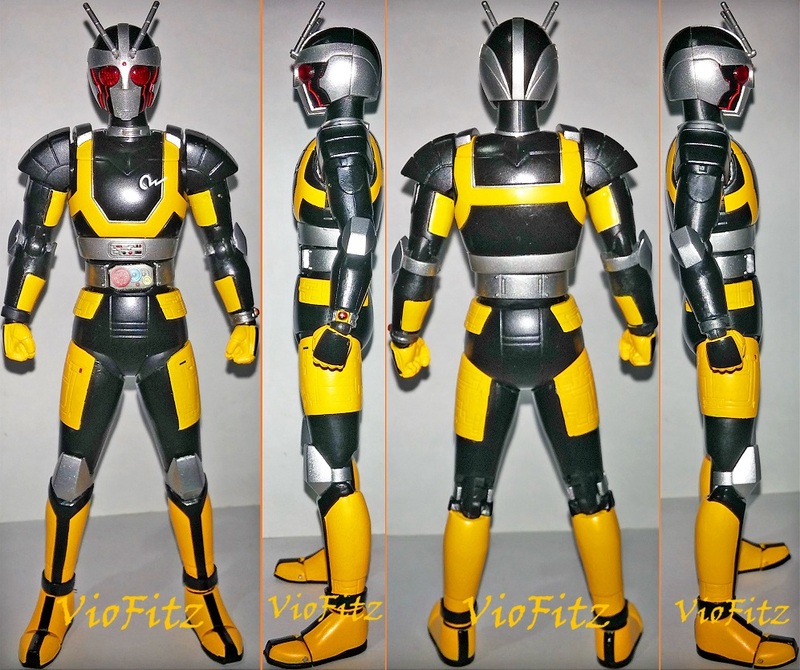 No more fabric details on RX because Robo Rider form was designed to be more robotic-like, with black, silver, & yellow coloring armor, Sunriser resembles a gearbox, white colored R2 symbol (which is sculpted), & black with silver & red colored grasshopper helmet. He is meant to become bulky but, he looks slimmer than I thought… The details are pretty intense so far, especially on the helmet. 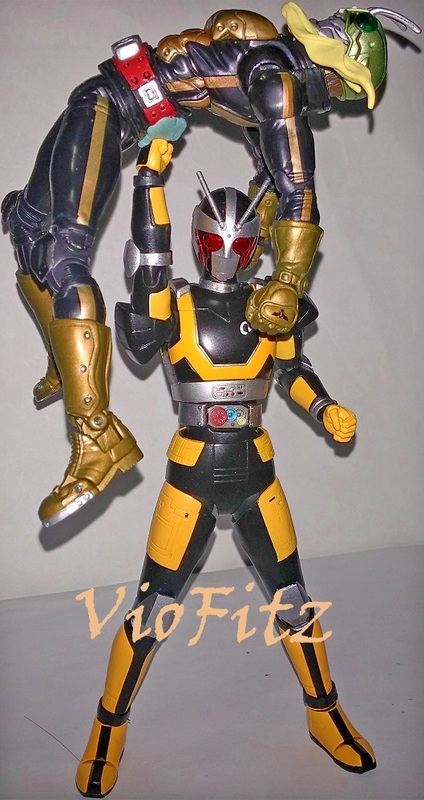 Again, Robo didn’t have any diecast material on him, so he’s light to hold. 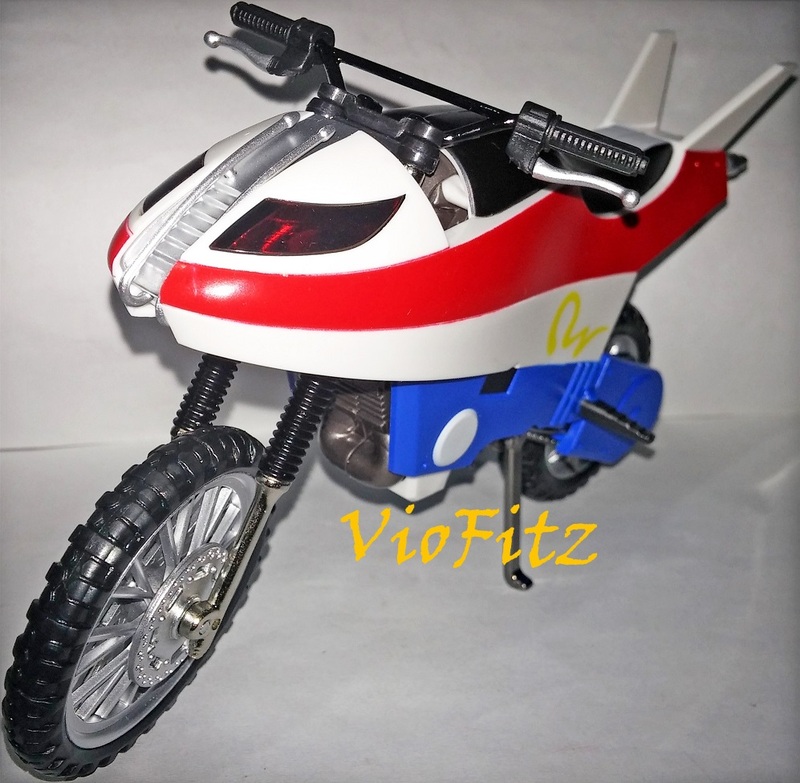 Roboizer was made to be accurate enough to the show counterpart but, it has the same chassis as both Battle Hopper & Acrobatter. 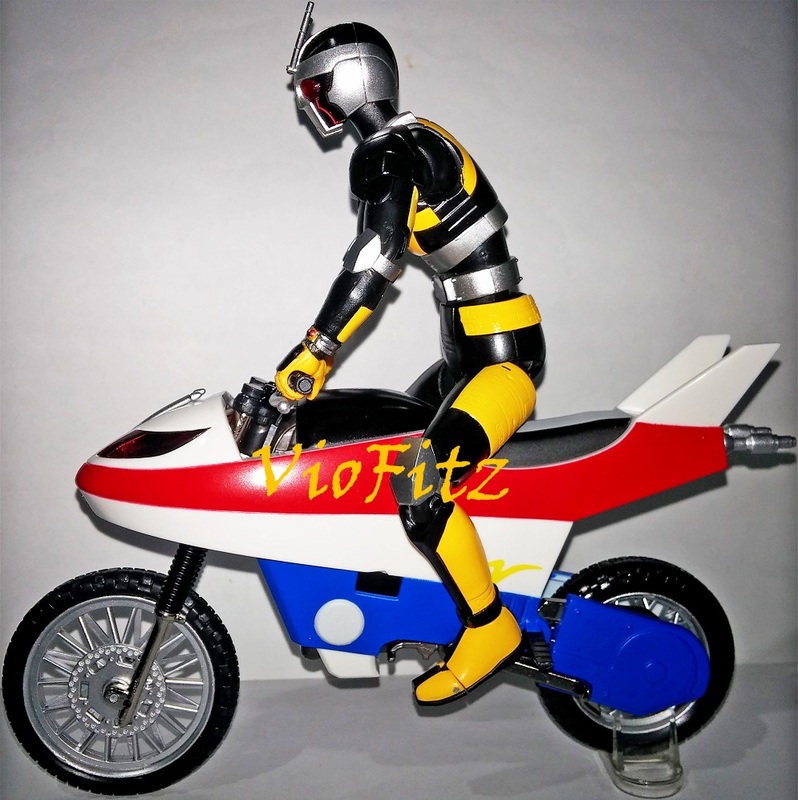 Unlike Acrobatter’s metallic coloring, Roboizer’s body was colored simple red, white, & blue resembles to a country flag like Netherland/Dutch, with yellow R2 logo, black colored seat with gray for upper seat. This form of Acrobatter has 2 spikes & 2 blasters mounted at its rear. Also, Roboizer actually got an antennas as well but, they’re not shown stick out as Battle Hopper & Acrobatter did, instead both were put on it’s head. The antennas are made from a hard plastic & each of them got a peg joints to be plugged on it’s head. 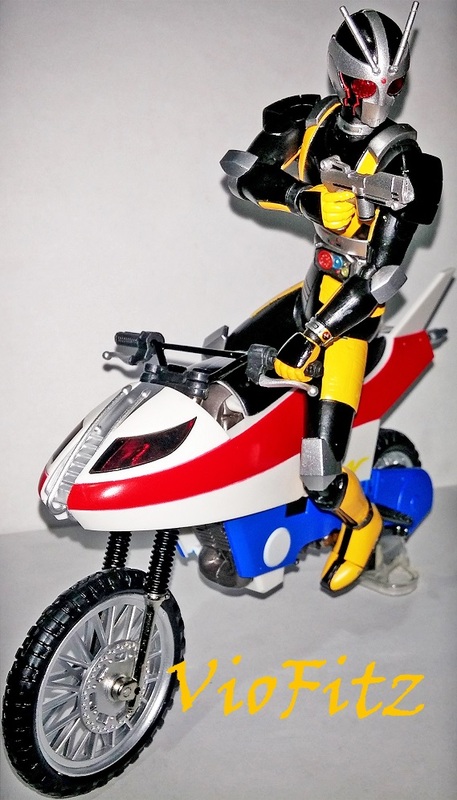 Seemingly Roboizer isn’t a motorcycle that capable for riding a higher ground & hopping around so, Bandai didn’t include a joint connector for jumping scene (for Stage Act Vol. 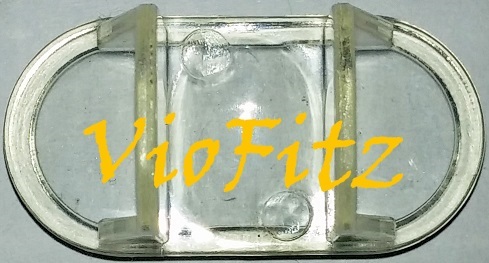 04). 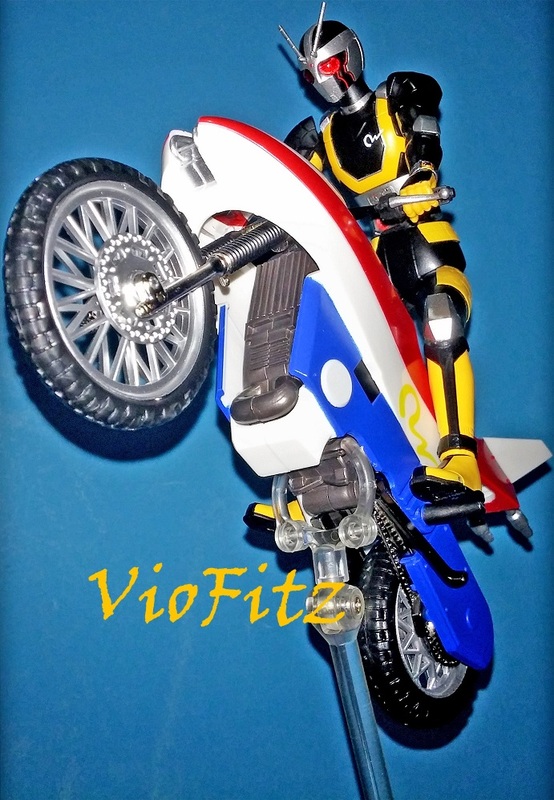 And Roboizer only appeared in 1 episode but, it doesn’t shown jumping/hopping however, the bike was based from Suzuki RH250 which is the same type as Acrobatter so, Roboizer should be able to do jumping/hopping or riding a higher ground. 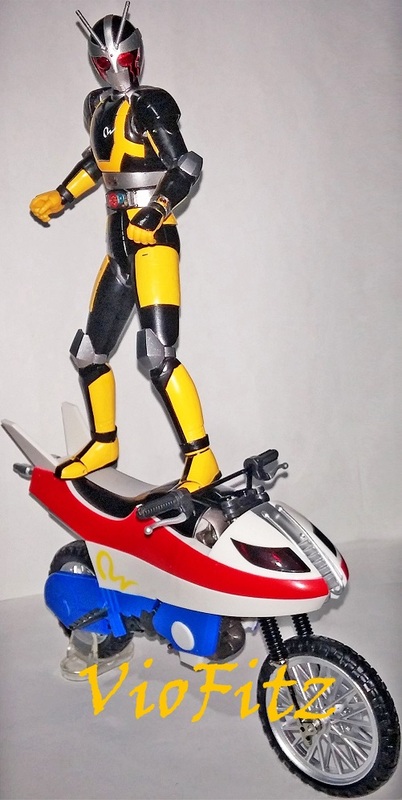 Roboizer appeared mostly on the opening intro of Kamen Rider BLACK RX but, only run on the flat ground. Robo Rider got a very nice details on the Helmet Sculpt! 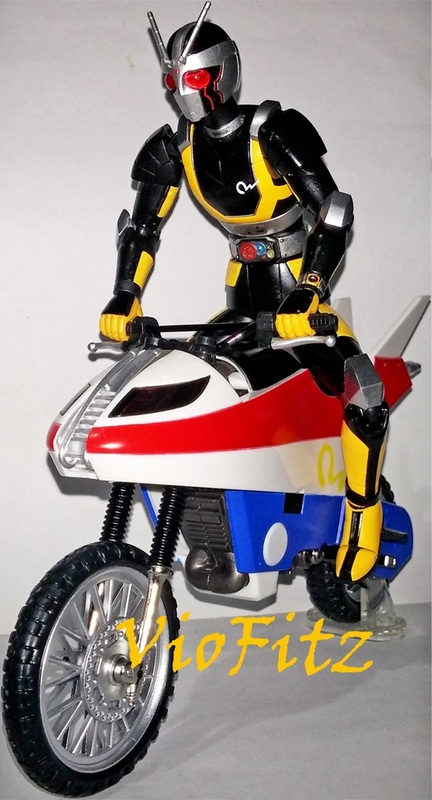 The overall helmet looks very faithful to his real life helmet except his antennas since I noticed there’s a slight differences between the original one from their shape but, it’s not a big deal though. The paintjob is pretty nice so far & his antennas are also made from a hard thick plastic just like RX antennas. I think his head is the only thing that I like from this figure, & his antennas are movable but, they got limited movement & it’s quite hard to move them. 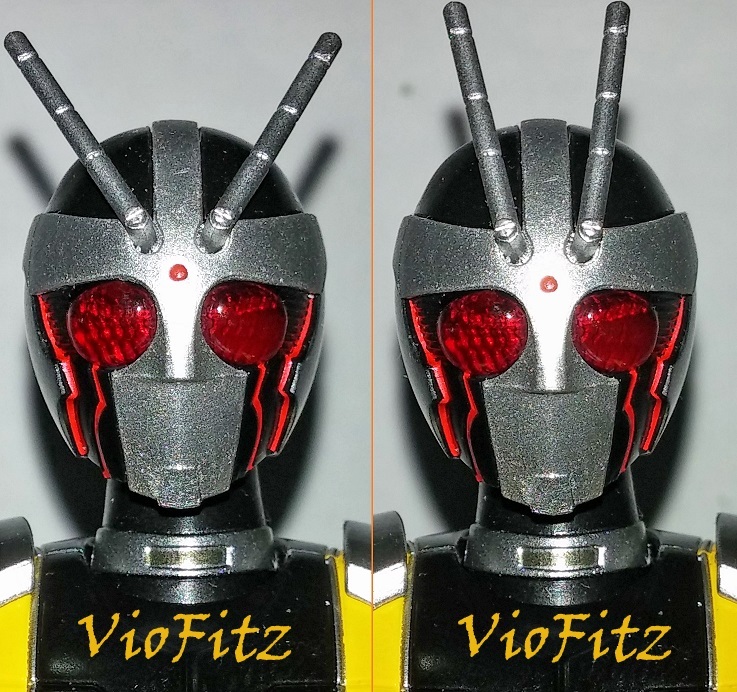 The interesting thing from Robo’s helmet is there’s a red lines lower his compound eyes, resembling like a tears. 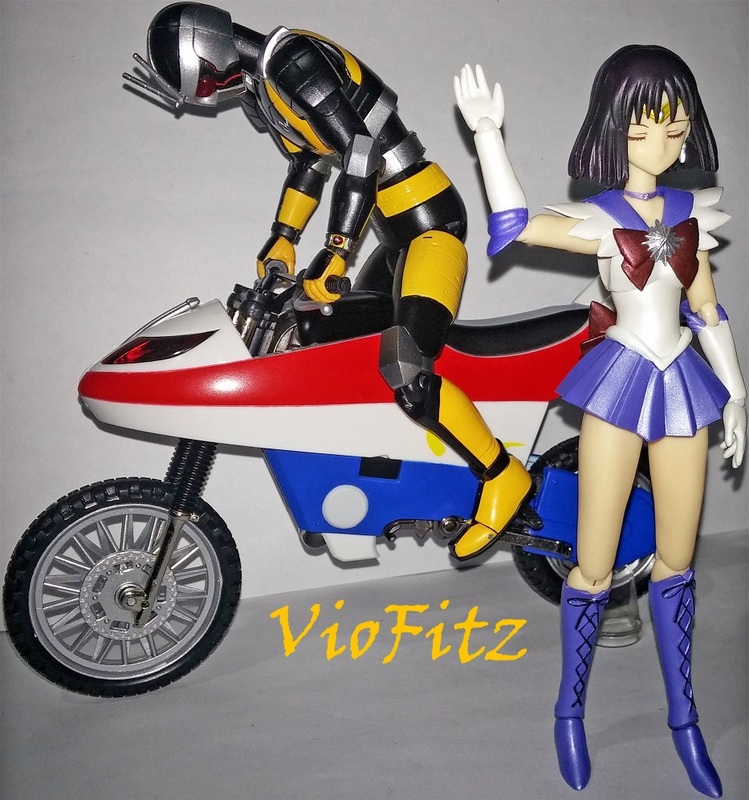 Of course, he’s a Prince of Depressions… I mean Sadness… Everything on the helmet had a very nice finishing so far. Actually, Robo has a good proportions but, he didn’t looked to be bulky as he is in the show. 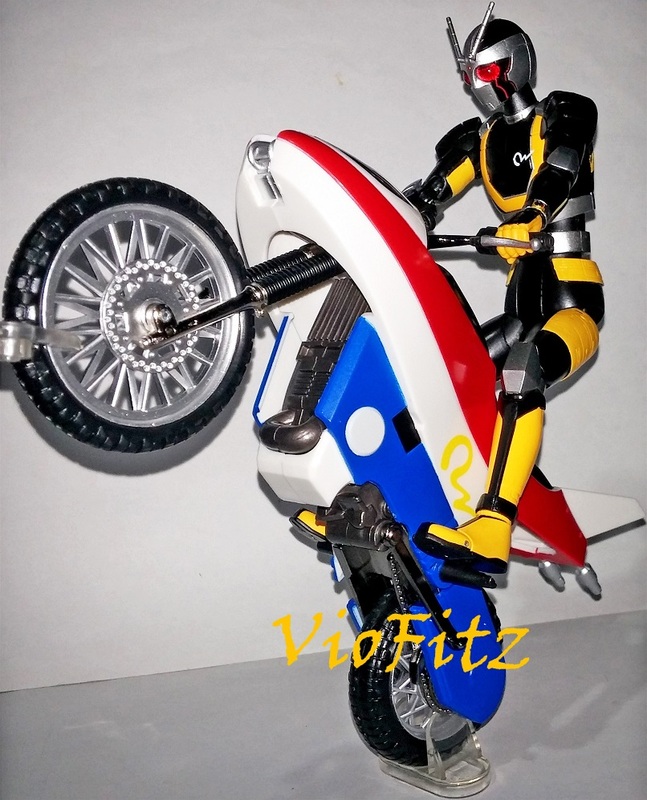 He is a mix between BLACK & BLACK RX Renewal, except he got a very limited on the leg’s movements. Like BLACK, his knee pad was removable since I’ve experienced 2 of them bounce off when I tried posing him riding Roboizer. 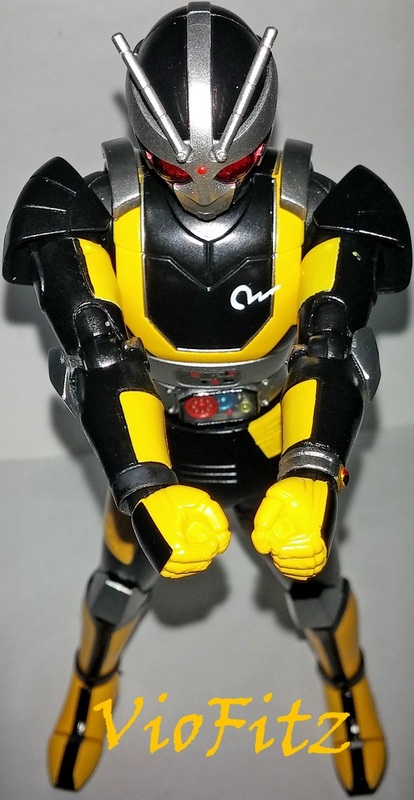 Robo does have ankle wrists that are molded separately but, they’re sticked tight. 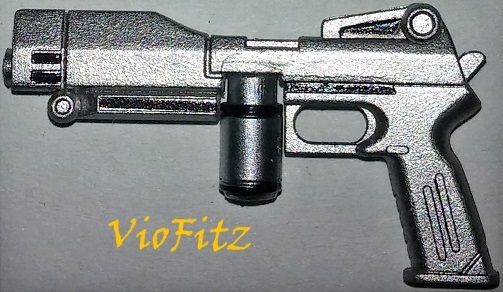 The gearbox like Sunriser belt was made to be exactly like in the TV counterpart as they didn’t missed a single of the gears on it but, the shape of the buckle looks different from the show. 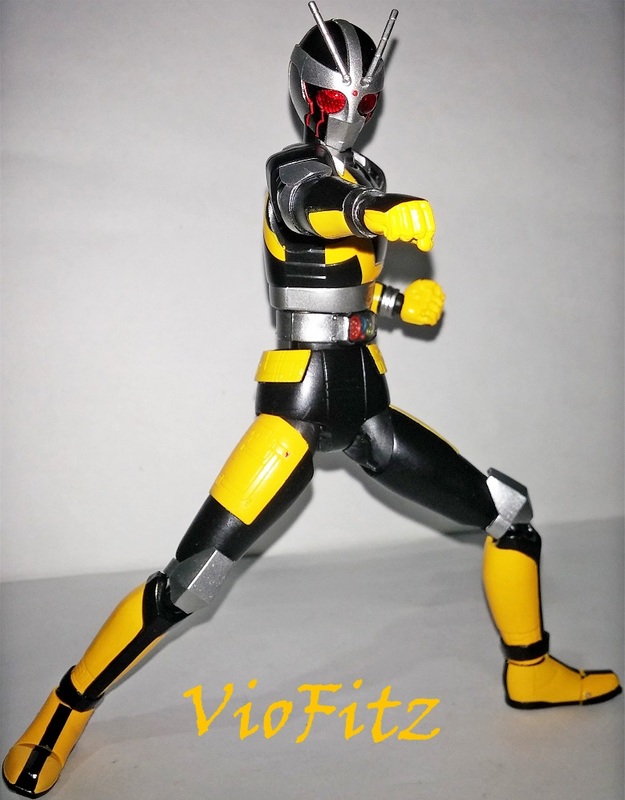 There’s another meticulous lining details on his thighs & hips but, the center sculpt on the silver lines of his torso looks kinda cheap somehow. 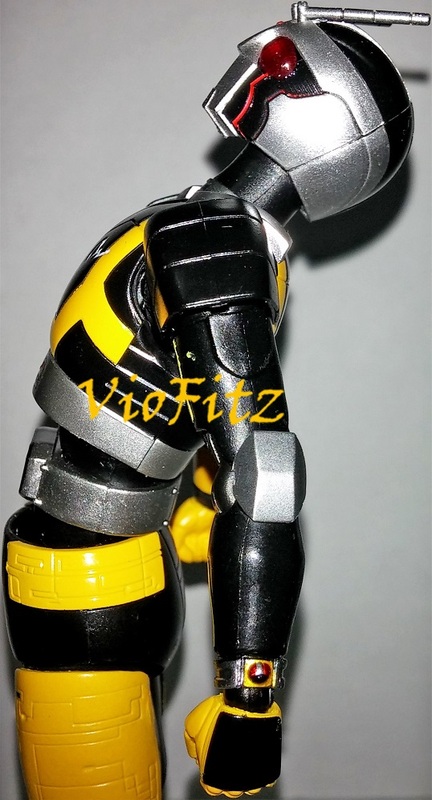 Each of Robo arms had elbow pad just like RX Renewal but, it’s colored silver & this won’t make the pad becoming an obstacles for his elbow articulations. However, the positions of the right elbow pad was a bit different as it doesn’t looked straight like the left one but, this is very unnoticeable unless you don’t feel comfortable with it. The paintjob of my Robo actually a little messy on his arms, in the front view, his right arm has black paint bleeds to the orange side of his arm, while the left one has a paint transfer of the orange from the black side of his arm. 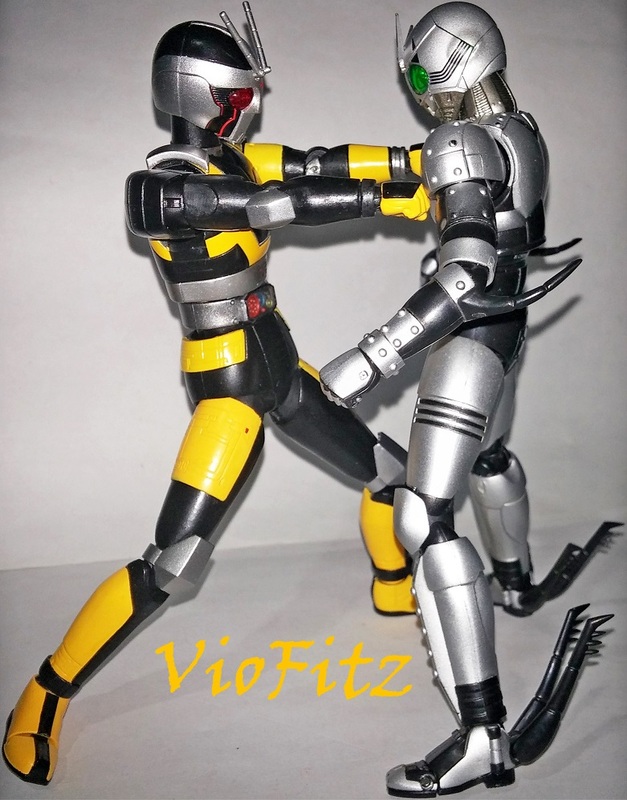 Like every BLACK series figuarts, Robo got upper bicep cut joints & creating crossed arm pose is a piece of cake. 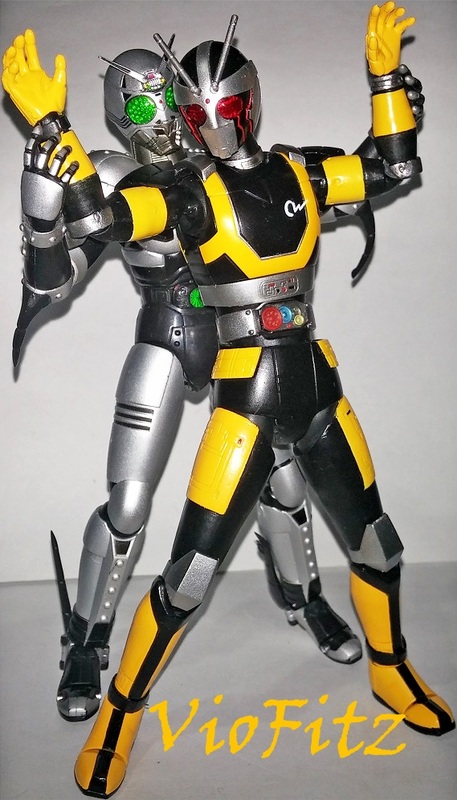 Unlike RX Renewal, Robo’s butterfly joints can do hug arms closer. Thanks to his gigantic crotch, we cannot create dynamic posing for him. 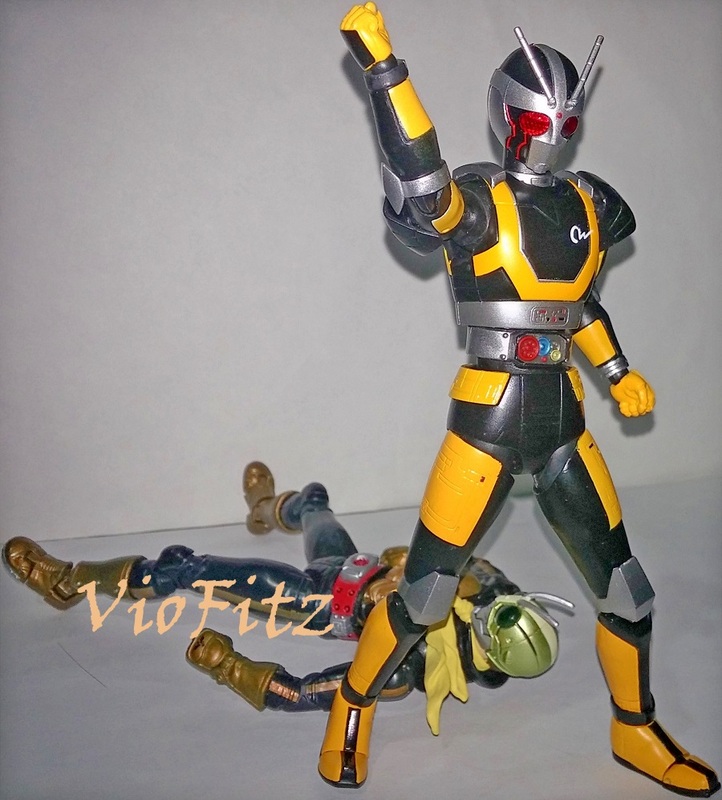 This is one of a total letdown for him, because of this he can’t do a sitting pose perfectly. 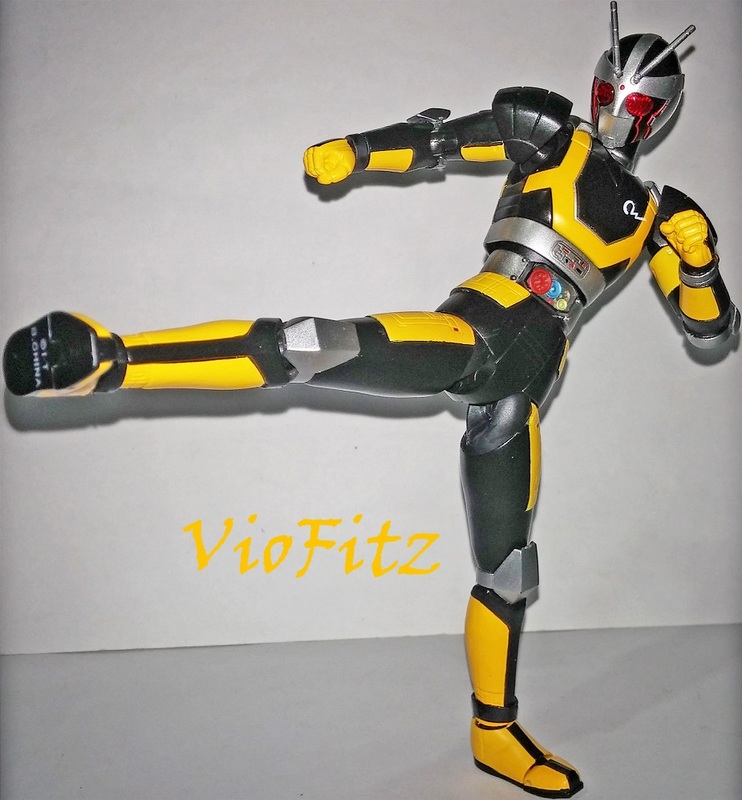 His knee joints are hideable enough, & elbow articulations works the same like other SHF but, he has a very limited feet articulations as he cannot bend his feet very much. 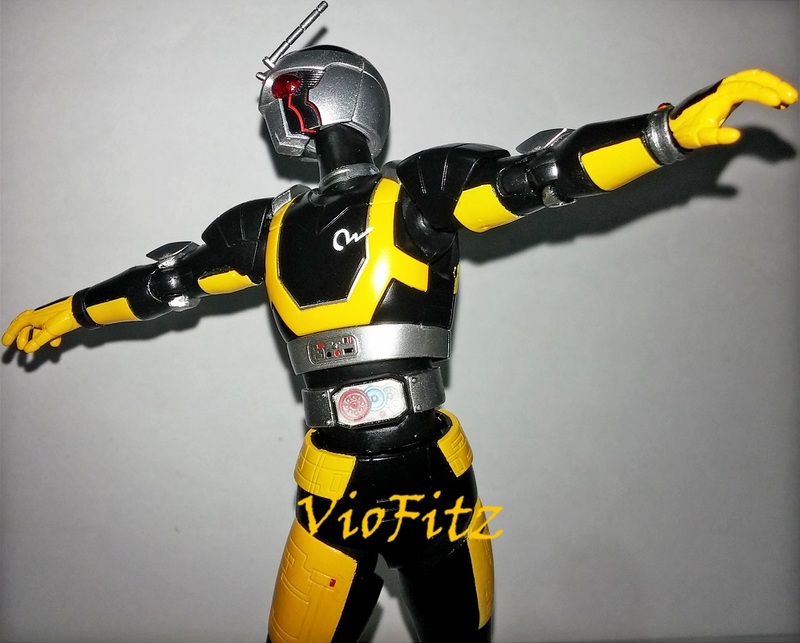 We can also bend his chest to the front & rotating his arms for full 180 degrees. The funny thing, since he had a complex articulations on his head, he could also bend down his head deeper but, that gap…. 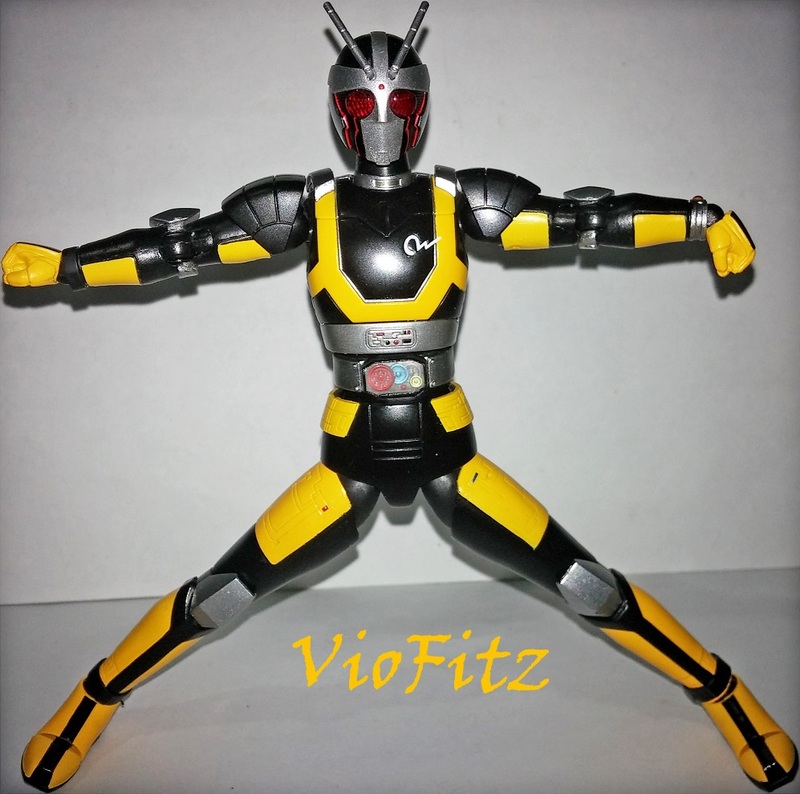 Oh, my God… His crotch articulations is even worse than BLACK & BLACK RX Renewal, he definitely cannot do gymnastic split pose… I intended to recreate high kick pose but he posed more like performing a low kick… Of course another big letdown… but, his feet could balance himself so I don’t need a display stand posing him. This is how Roboizer looks from certain angle, it looked bulkier than Acrobatter for sure, I think that is why it does not capable on riding a higher ground or hopping. Roboizer’s paintjob is perfect so far, although I have to admit it looks very simple made. Articulations works same like Acrobatter & Battle Hopper so, I think no need further explanations to describe on this one. 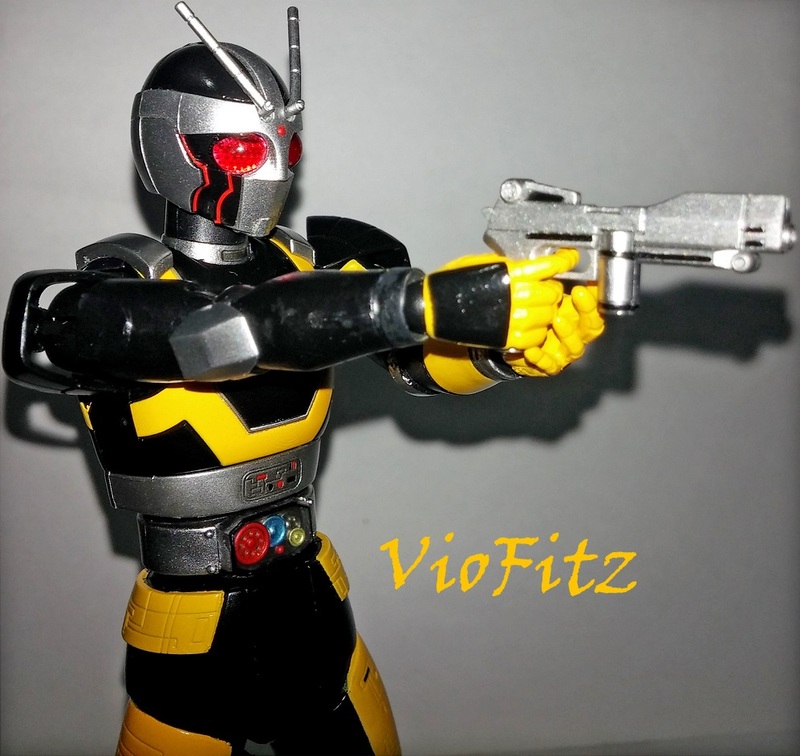 One of the accessories that Robo had is none other than his Vortech Shooter weapon part! 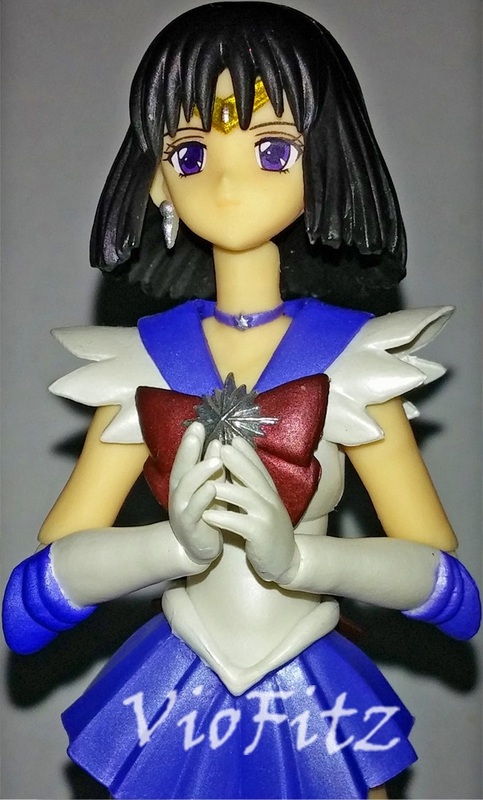 The sculpt is pretty nice & faithful enough to the show, I liked the way they included black paint on several sculpt details. 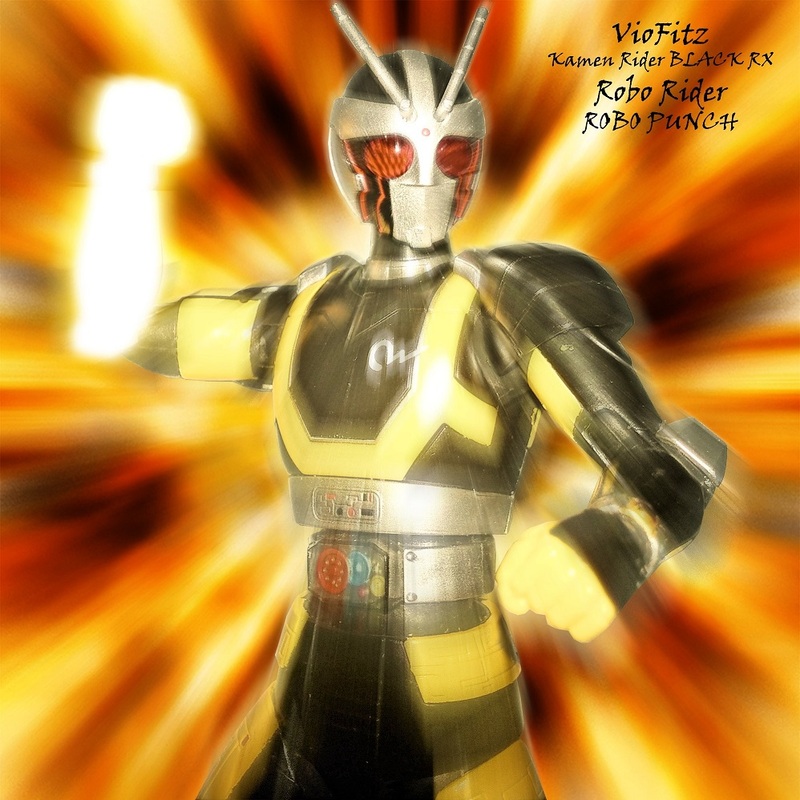 That’s it, Robo doesn’t have any other weapon he wield but, his other attacks is Robo Punch & Robo Kick. Wake up, the hero moeagare! Yeah… Roboizer’s only accessories for it is only clear colored wheel stand display to maintain the position… Oh, dear… Madre de dios… Shimatta!! Blow me bagpipes!! What’s with that Robo’s awkward positions riding Roboizer?! 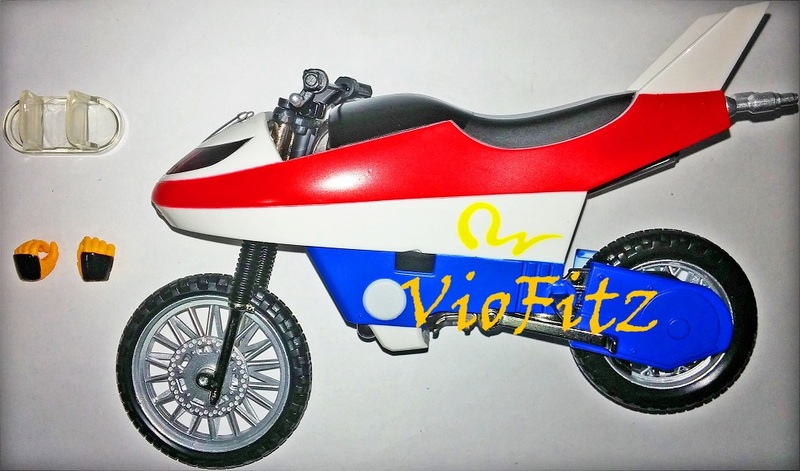 Is he actually riding a bike or… Odong-odong (Indonesian’s children amusements rides)? 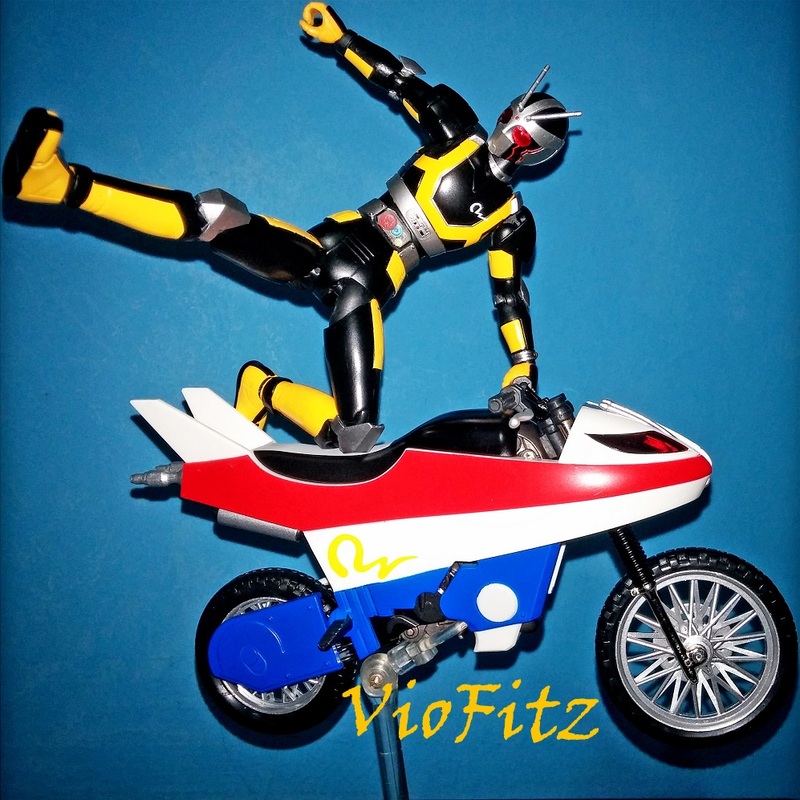 Well, he sure looks like riding odong-odong, though… Right, this is the best I could to recreate Robo riding Roboizer, To tell you the truth this is really-really embarrassing… Even with my best but, this mostly to blame from Robo’s limited thigh articulations thanks to that crotch…. 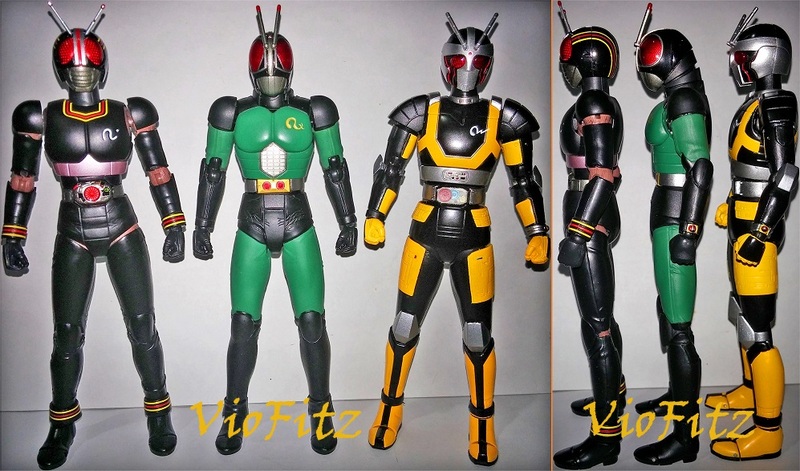 The height comparison, in both photos Robo appeared to be equal enough with Black but, Robo wasn’t bulky enough compare to Black & RX. However, his arms, hands, crotch & legs are sure bulkier than both Blacks. His joints are actually hideable if he stand like this but, when it comes to the certain posing the gap of his waist will be clearly seen compare to both Blacks. Of course, Robo doesn’t have any fabric details like both Blacks due to his robotic design. 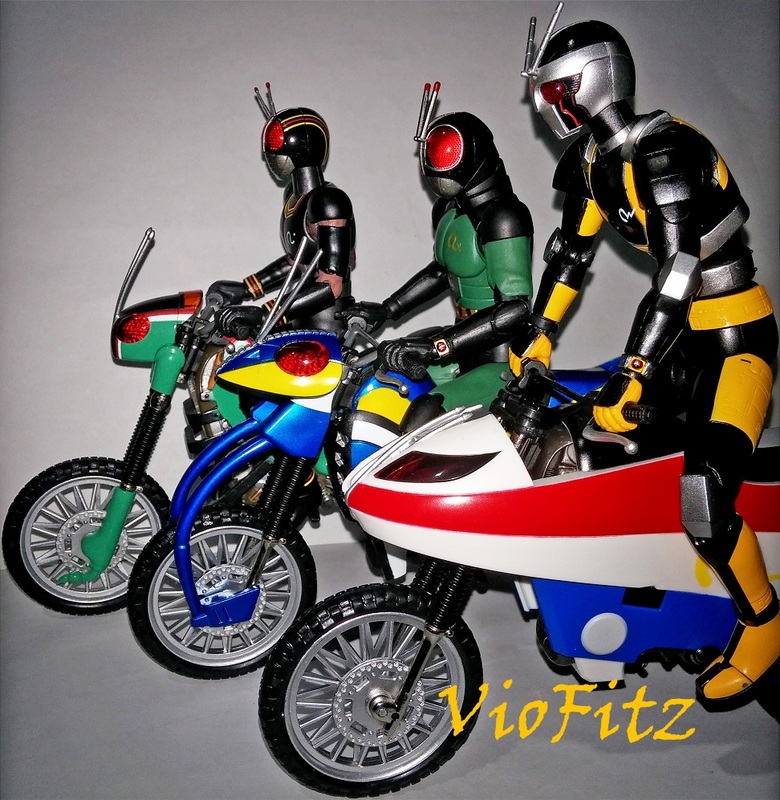 You can read my BLACK & BLACK RX Renewal review here & here. 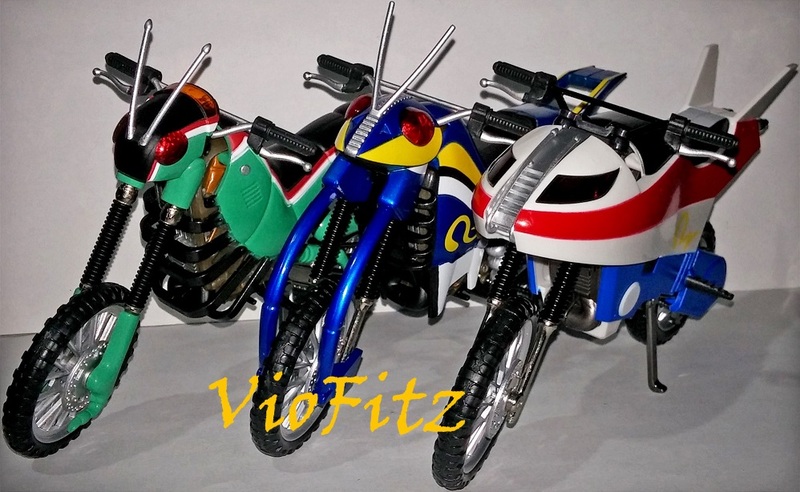 The review also includes their respective bikes. 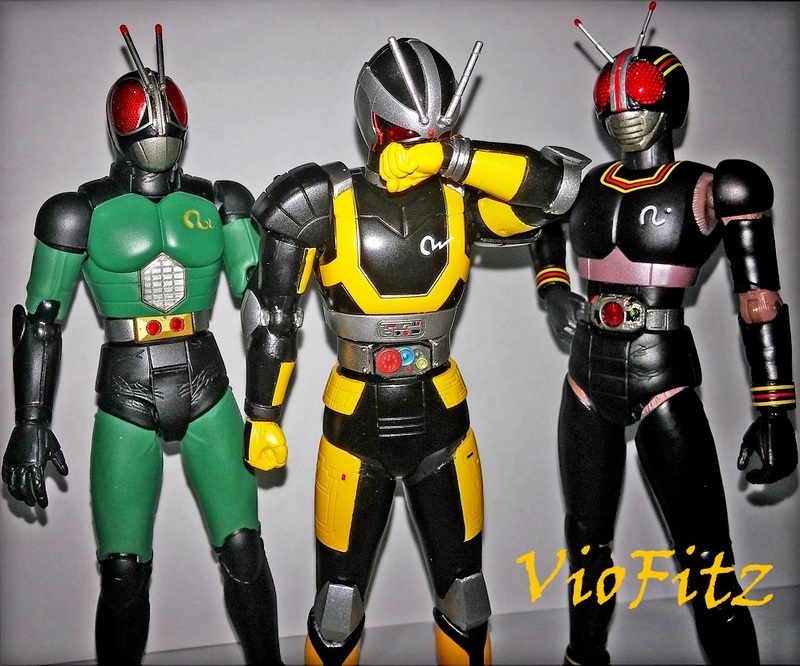 Well, this is why I thought Robo was too slim, comparing to the original counterpart the SHF looks way too slim. Not bulky as in the show… Do not be fret, the coloring are actually the same but, since I’m using a camera flash so he looks yellow-ish. & one thing to notice, my Robo actually got the faithful paintjob as in the series which his right wrist was black compared to the most reviewers which got a silver colored right wrist. I guess this luck actually made my day to think less on how disappointing he is in most products but, I don’t give a damn though if I got the same as them. A hero filled with Flame & Tears. 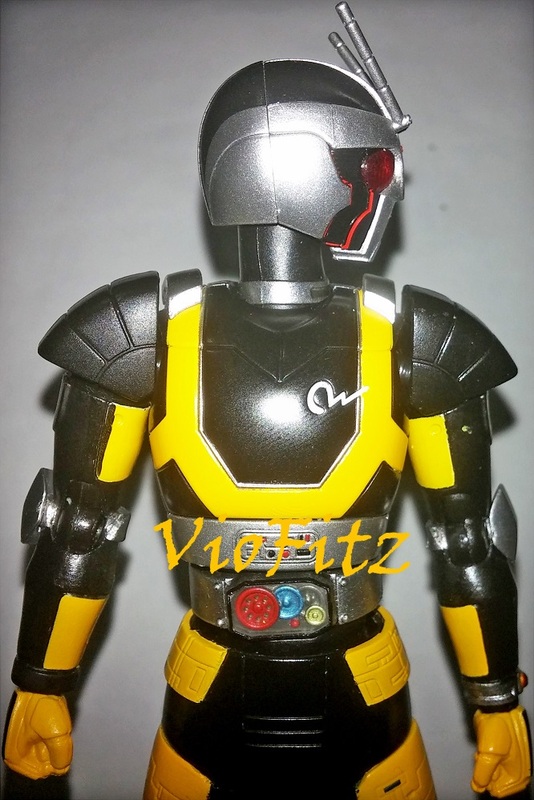 Okay, contrast to the predecessors I hate this very much, Robo is a total letdown, definitely super lame work from Bandai!! 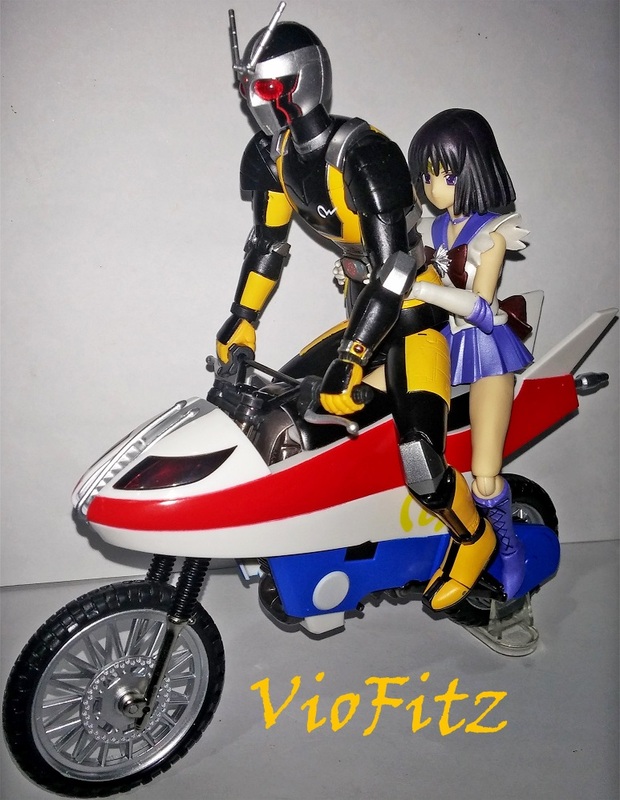 If I knew he’d turned out like this, I shouldn’t choose him over Figma Hibiki Ganaha… Well, what is done then it’s done… Don’t get me wrong, I’m not blaming Roboizer at all but, Robo is to blame mostly. 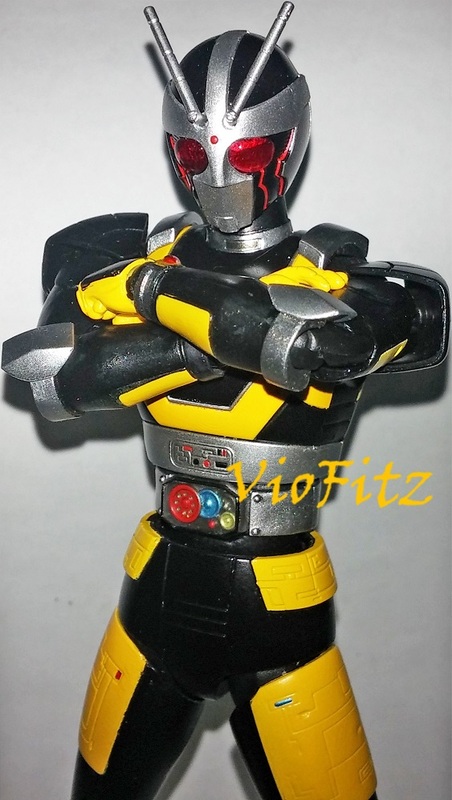 I have a strong feeling that Robo will become the next list to be renew, frankly I’m getting sick of that “Renewal” word, so if he truly get’s a Renewal, I’m thinking to pass him since I had enough with how Bandai did on ShadowMoon’s Renewal which almost got no different from the old one. 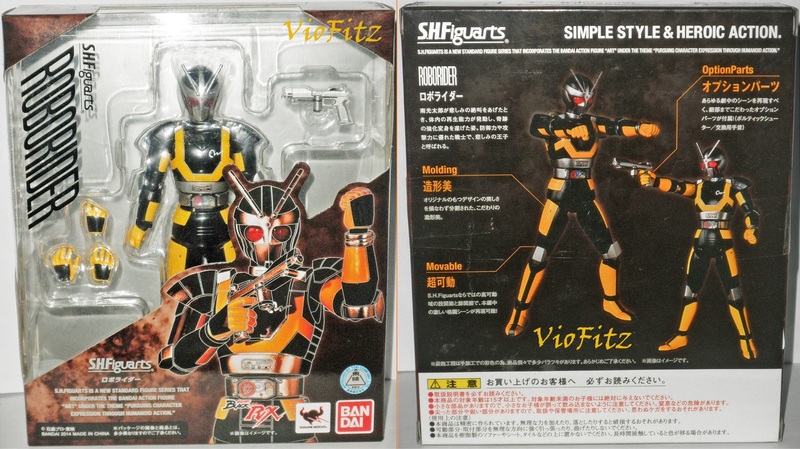 Also, Like RX & Acrobatter, Robo Rider didn’t come with Saban’s Masked Rider, Super Gold (their US Counterpart series) release so far, the US release only included with Bluefin’s stickers while the box remains Kamen Rider BLACK RX franchise with Robo Rider for his name. Well, you should’ve known back in 90’s the US series didn’t success as Mighty Morphin Power Rangers series, instead received full of negative critics. 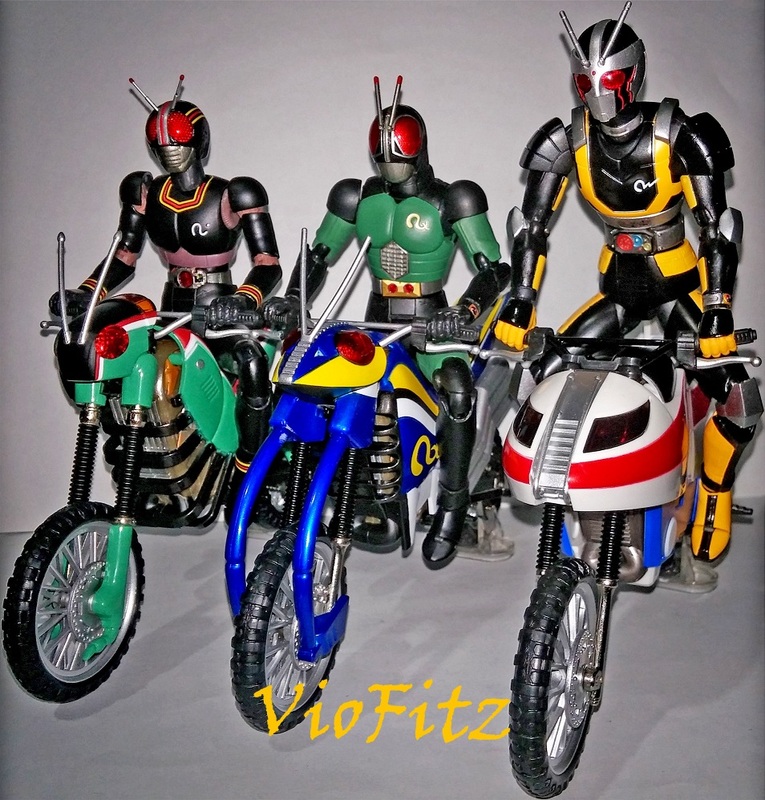 Well, that’s just great because that show was a disgrace for Kamen Rider series. Complex articulations on Robo’s neck & head. 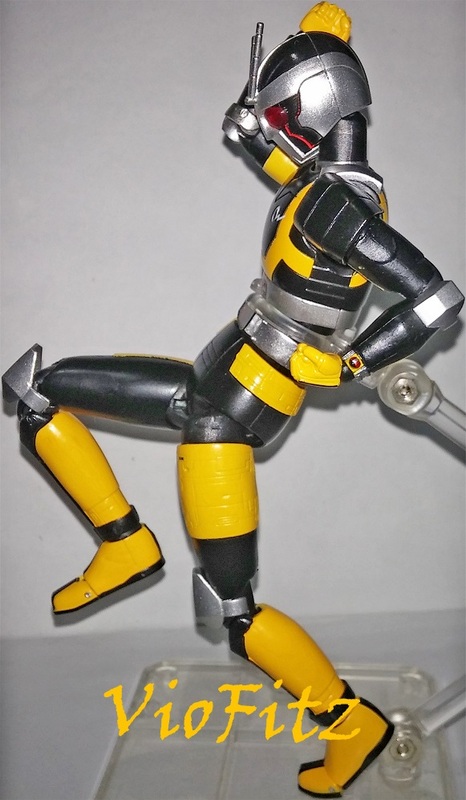 Robo can balance his low kick posing without stand. 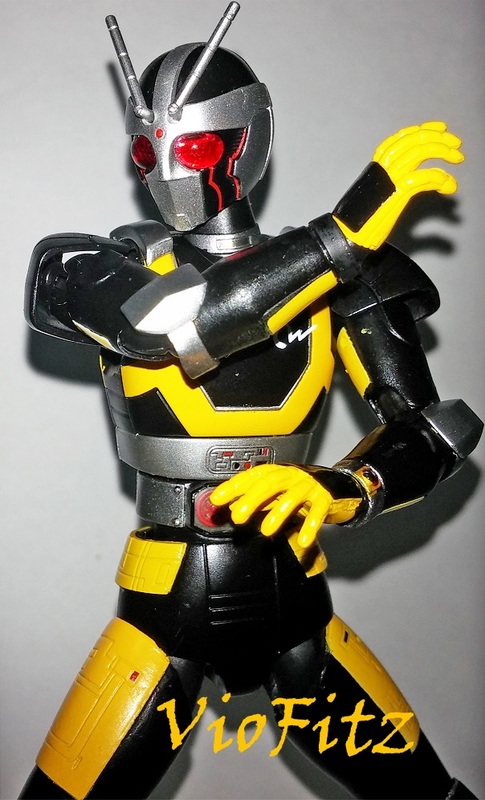 Lucky enough for me to get him with the black colored right wrist. Good sculpt work & paintjob. Accurate enough to the show counterpart. Can actually do a jumping scene, since it can balance the body with stand. Slight paintjob problem on both arms. Very limited movements on the thighs & feets. That huge gap on the waist. The left antenna is hard to move. 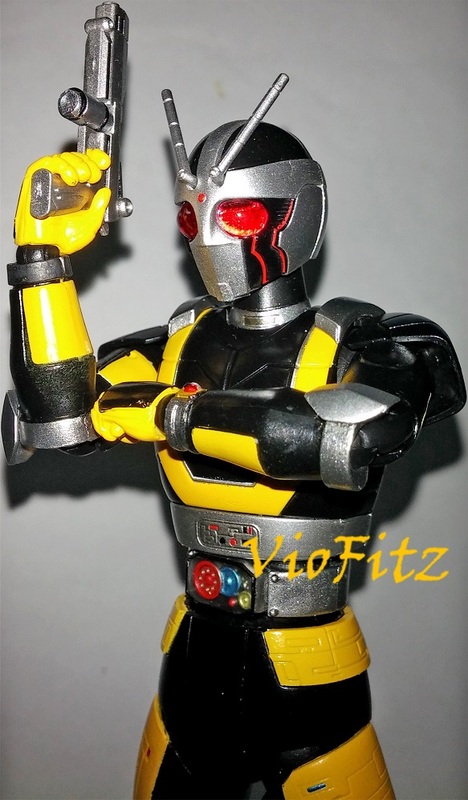 Very little accessories, they should have include more of hand accessories for Robo. Exchanging the hands are hard. Very little accessories but, it’s acceptable since it doesn’t appear much on the show. 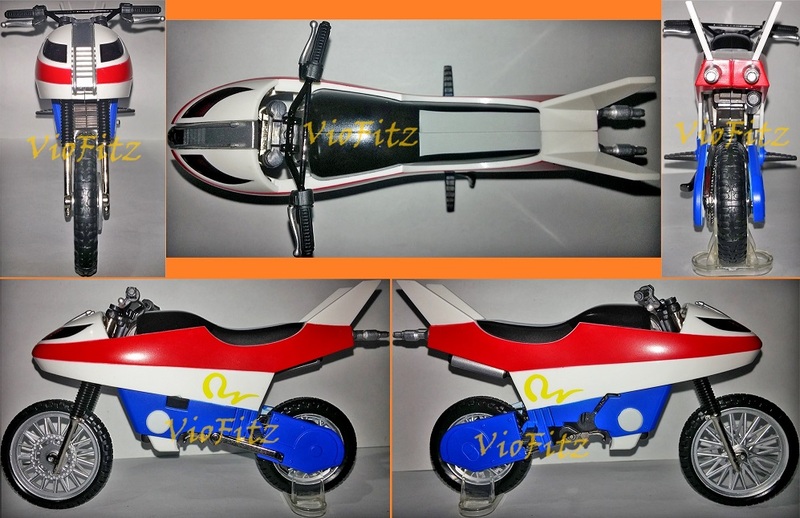 Another reused chassis from the previous product. They really shouldn’t have to included Robo’s grasping hands in Roboizer. 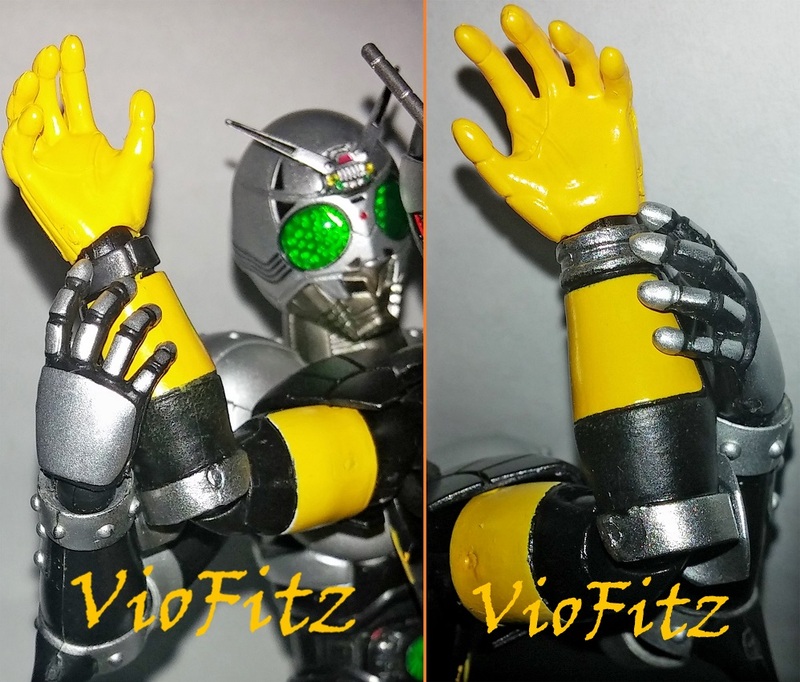 Different tone color on Robo’s grasping hands. 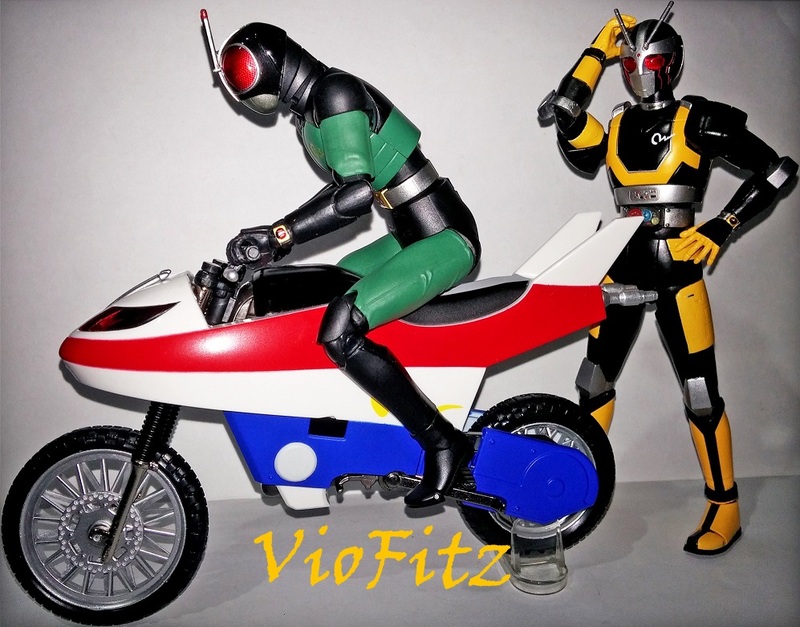 The bike don’t fit with Robo Rider because when Robo rides it, he looks like riding an odong-odong, instead of heroic bike like other Kamen Rider does. Ugly & plain looking box design. 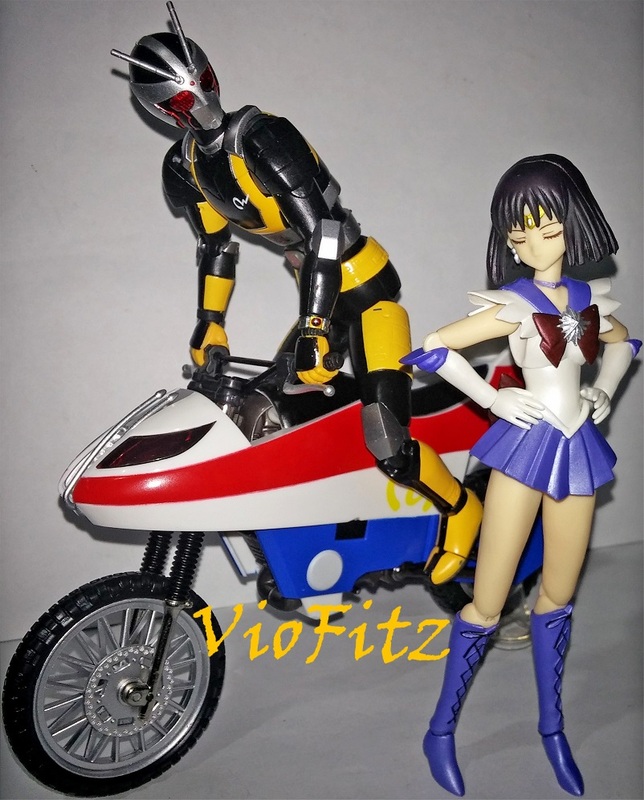 So cool… I’ve always wanted to ride along with my Prince. 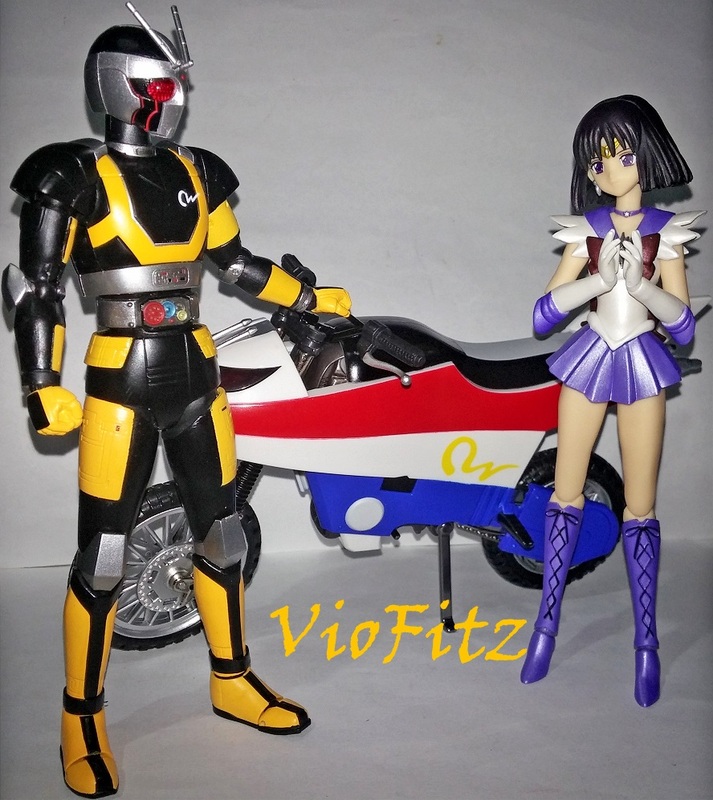 Aww, you’re such a sweet little thing, Hotaru-chan….